Happy Friday!!!! It has been a very busy week! This week I went back into the archives and made a couple of my favorites, Salsa Chicken with a side salad & a chicken version of my Chili! They are both amazing and I encourage you to give them a try, soon, YUM!!! A couple weekends ago the hubs and I celebrated our 6th wedding anniversary! We’ve been together since high school, yea 15 years! The past 6 years have been busy especially having our boys. It is a wonderful thing to have a night away to spend quality time just us. 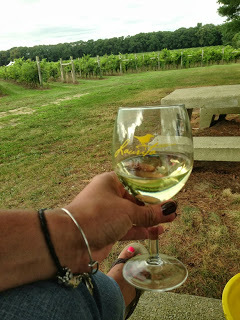 My mom gave us a night away for The Inn at Laurita Winery. I love a good bed & breakfast and this place is beautiful!!! 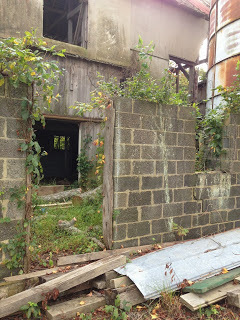 Since learning about this place, yea just like 20 minutes away years after its opening, we’ve visited several times. There was the Food Truck Invitational & the Irish Festival. Its a wonderful day trip getaway! Some wine, gorgeous scenery, food and relaxation! 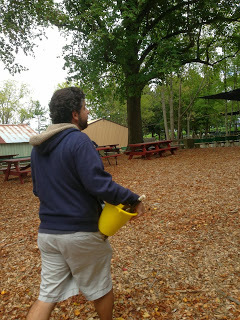 We headed to the winery first, enjoyed wine and a walk before heading back to the Inn. I was already in love with the winery and now i’m in love with the Inn! The building is from the 1800’s and is just stunning. The Inn Keeper, Janis was a sweetheart and fabulous cook!!! 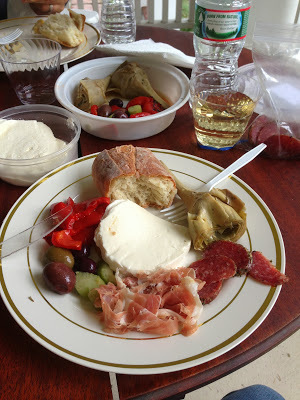 Me being a self proclaimed mild food snot, I decided I wanted to pack a romantic picnic dinner for us, my very favorite stuff in the world… antipasto!!! We had a lovely balcony with a couple rocking chairs out there, so I dragged a small table out there and we soaked in the fresh air, Italian deliciousness & some wine. It was perfect (the fact that I already had a lot of wine in me and was plenty relaxed made it fun too)!!! 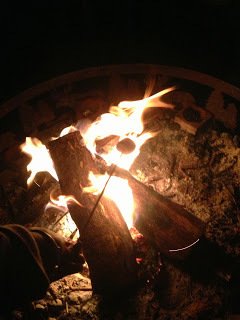 After hanging out for a bit we decided to head outside and make use of the fire pit and marshmallows they have available for guests to use at their leisure. The next morning was also perfect, thanks to Janis’ delicious breakfast!!! A lovely breakfast bar was set up with yogurt, fresh fruit, an amazing fresh baked crumb cake and more. Then a two course breakfast! 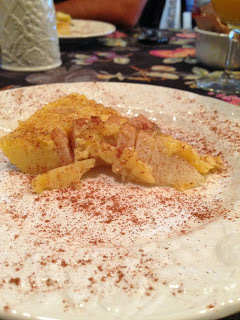 It started with a French custard with pears, HEAVENLY!!! 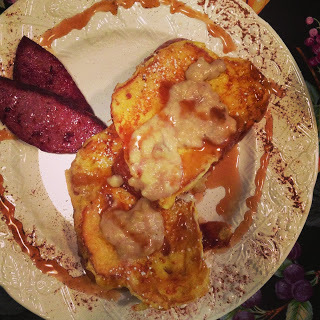 Then the main course, a challah bread French toast with caramelized banana and pork roll (I’ve lived in NJ since I was 3, this was my very first time having pork roll). Everything was thoroughly enjoyed! 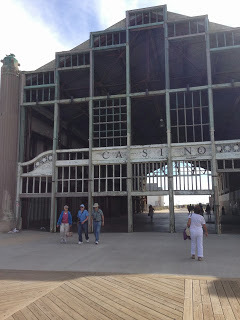 The next day we enjoyed a couples massage then headed to Asbury Park Boardwalk for lunch. We headed to Cubacan. OH MY!!!!! 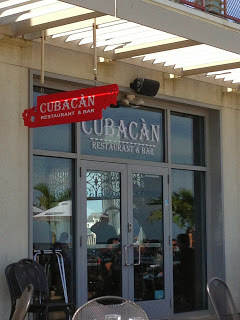 The food was phenomenal and it was awesome being able to sit outside right on the boardwalk! We decided to all small plates and oh boy did we eat!!!! 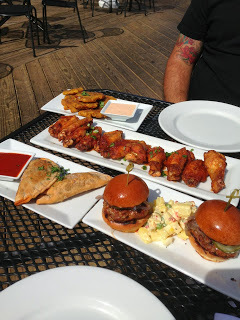 Angus Beef & Chorizo Sliders, Empanadas, Sweet & Spicy Wings & Plantains. If you have not tried this place, you NEED TO GO!!!! I can’t wait to go back and try their entrees! 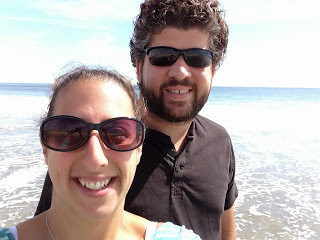 We had a wonderful mini staycation to celebrate our anniversary… definitely check out these places.